British environmental think tank Carbon Tracker has warned there is about $US2.2 trillion in coal, gas and oil projects around the world that could become unviable. Their report indicates the US has the highest level of exposure to the fossil fuels industry, with $US412 billion in future projects set to become unnecessary. Australia has a total of $US103 billion in potentially uneconomic developments. ANalsyst Mr Fulton – a former investment banker who now works as a climate change adviser - says the whopping $2.2 trillion figure was revealed after experts stress tested planned fossil fuel projects under a scenario where global government agree to limit warming to 2 degrees Celsius. 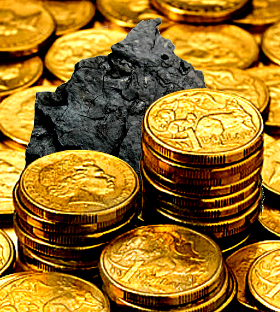 “It's about $US1.8 trillion for oil and gas and a couple of hundred billion for coal. Generally these are just the numbers that the industry is estimating to get these things up and going at a reasonable return; our return happens to be at 15 per cent,” Mr Fulton told ABC reporters this week. “Projects like the Galilee Basin, the Carmichael mine, they are just not needed economically in our view. “There's just so much coal out there, that does Australia once again, all these companies, want to bet on a highly volatile, highly difficult-to-read market and produce the world's largest coal mine, which by the way, even if I'm just an economist now, all you're doing is risking a collapse in the coal price. “I look at this in terms of supply demand and economic break-even. I can only tell you what the data says, so I'm not an advocate. “I happen to have run a two degree stress test because I think that is what companies should be looking at. Unsurprisingly, the Minerals Council of Australia (MCA) does not agree that $US100 billion worth of Australian coal, oil and gas projects are unviable. “Our major customers are those customers in Asia where economic expansion will be taking place,” MCA executive Greg Evans said.